Gun Dog Championships in Branched Oaks, Nebraska! Holding Maggie is Mr. Ray Marshall who expertly scouted Maggie to her win. Bitty and Maggie are both out of the outstanding field trial dam, Gertrude's Blue Brandi, owned by Scott and Alease Bodenstab www.Hi-Tailyn.com. 14A) FC Scattergun's Maggie (GSP female) Ed & Trudy Moody owners, Ray Dohse handler. 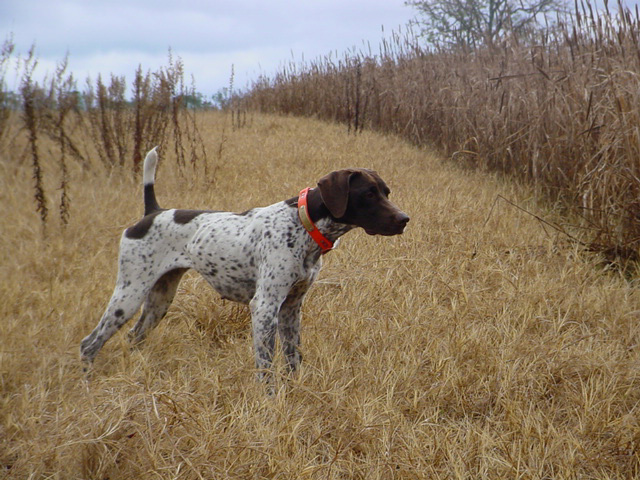 14B) Phineland's Gustaverson (GSP male) Darlene Mast owner, Jim Heckert, handler. Maggie ran a beautiful course with stylish work on her birds. She had a nice retrieve on course. Goose made some sharp moves and pointed birds on three occasions. He successfully completed his retrieve on course.